Since inception in 1879, ILFORD has been a name associated with photography. Whilst the company has evolved over the years, the drive to provide our customers with world-class products is as strong as it was over 140 years ago. As a result, ILFORD is one of the only companies in the world to offer its customers a ‘best in class’ solution for producing outstanding printed images and displays, regardless of their application. The ILFORD name is well established in the history of imaging and today continues to be associated with cutting edge technology thanks to its strong links to the photographic and commercial wide format markets, research and development, technical know-how and manufacturing capabilities. 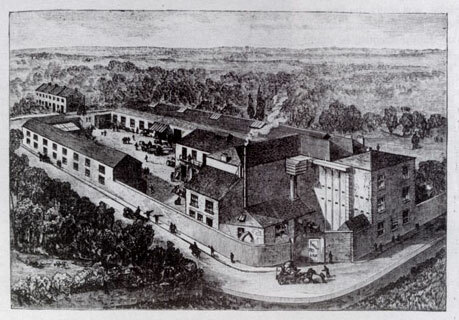 ILFORD is founded by Alfred Hugh Harman as Britannia Works making Gelatine Dry Plates in the basement of his house. The company became known as the Britannia Works Co. Ltd. The company goes public and Alfred Harman (then aged 50) retires from active control, possibly due to ill health, but continues to provide his expertise and experience for several more years. The company is renamed to become ILFORD Limited after the town of Ilford in Essex, UK, where the company was based. The ILFORD works is hit in the “London Blitz” during WWII. ICI take control of ILFORD. Ciba AG, Switzerland, acquire shares in ILFORD beginning a commercial co-operation between Ciba and ILFORD to develop Ciba’s dye-bleach print material (for making prints directly from colour transparencies). Originally called Cilchrome (‘Cil’ derived from the names Ciba, ILFORD and Lumière) the eventual product name was Cibachrome. Ciba built a new plant in Marly, just outside Fribourg (home of Tellko AG) to coat Cibachrome (renamed ILFOCHROME in 1992). The old Tellko factory in the centre of Fribourg was used as the finishing department. ICI and Ciba acquire all shares in the company. Ciba acquire all ICI shares in ILFORD to become sole owner of ILFORD Limited. Ciba merges with JR Geigy to become Ciba-Geigy. Lumière, who were acquired by Ciba-Geigy in 1962, become known as ILFORD France. Lumière Imaging remains to this day a key distributor for ILFORD in France. The ILFORD UK headquarters move to Mobberley, Cheshire. ILFORD is acquired by the USA-based International Paper company, owners of graphic arts materials manufacturer Anitec. ILFORD and Anitec merge to become ILFORD Anitec. Ciba-Geigy, no longer having any stake in ILFORD, require the Cibachrome name be changed. The announcement of the name change from Cibachrome to ILFOCHROME Classic was announced by ILFORD at the 1992 PMA show in Las Vegas. The sales and admin offices move from London to Mobberley, Cheshire. International Paper sells ILFORD to Doughty Hanson & Co.
ILFORD become ILFORD Imaging Ltd on 1st January under new owners Doughty Hanson & Co.
ILFORD enter the mass inkjet consumer market with the launch of the PRINTASIA Inkjet Photo Range of papers. ILFORD launch the GALERIE Inkjet Photo Range of paper and media. ILFORD Imaging celebrate 125 years of photographic manufacturing. ILFORD Imaging UK Limited go into receivership. ILFORD Imaging UK are subject to a management buyout, which results in the formation of HARMAN technology Ltd in February 2005. HARMAN continue to use the ILFORD name for traditional black and white products. In July 2005 Oji Paper, a 130-year old company based in Tokyo, bought ILFORD Imaging Group’s Swiss operations which It produces inkjet products and high quality colour photographic products under the name ILFORD Imaging Switzerland GmbH and includes the GALERIE and Printasia ranges. In May 2010, ILFORD Imaging Switzerland GmbH are bought by Paradigm Global Partners LLP. ILFORD announce the launch of BioMedia, a range of recyclable, biodegradable and incineration-friendly commercial wide format media and pick up the SGIA Product of the Year Media-Vinyl category. ILFORD announce a final production run of ILFOCHROME Classic in response to declining market demand attributed to the expanding popularity of digital image making. ILFORD announce the transition of their popular GALERIE range into 5 star GALERIE Prestige as well as launch the 4 ½ star GALERIE Premium range. February – ILFORD acquires CMA Graphix and Colorportal. April – ILFORD Group AG acquires TECCO GmbH. May – Ilford Imaging Europe GmbH established as a joint venture between Chugai Photo Chemical Co Ltd of Tokyo, Japan and CR Kennedy & Company Pty Ltd of Melbourne, Australia. Both partners have a combined history of 146 years in the photo industry and are committed to implementing long-term strategies for growth, with respect for the history and traditions of the Ilford brand. Ilford has for 135 years represented outstanding imaging quality; this will continue well into the future. ILFORD would like to thank Maurice Fisher and ILFORD Photo for some of the historical information of the timeline.